Wade spent the overcast day NEEDING to be in this chilly pool. We're kicking off summer by keeping an extra-extra outfit in the car. I think I've recovered from being out of town. Not enough to put up pictures from our escapades, but enough that dinner has been real food for multiple days straight! Let's start with some quick pregnancy updates, cause it's the elephant in the room. Or I'm the elephant in the room...something like that. The girls - I have an appointment next week that will give an actual update, right now I just know they're getting bigger and more scrunched (no, really?!). Their movements are a little smaller, like they can't get momentum behind their kicks and punches anymore. No more stretching and lounging about for these two! I'm tired. Like multiple-concealers-to-cover-up-my-eye-circles tired...when I actually put on make up. I am still sleeping relatively well, but make myself nap when Wade does - that's my excuse, and I'm sticking to it. My to-do list is getting smaller! Wait, not exclamation mark. I haven't been getting things done, just prioritizing and knocking things off said list, cause, y'know, tired. I'm bored. It goes along with the being tired thing. I just don't have the energy to do extra activities! Telling myself that I'm okay being lazy - I only fool myself 50% of the time. I think I strained my top right ab muscle. I thought I had no core strength before, apparently I did... I've been resting it the best I can and it's feeling better. If only my inside and outside children could just keep their elbows, knees and other pointy/jabby parts away, then I'd be in good shape. I have to sit down and cross my legs to sneeze. Husband has to carry the laundry up/downstairs. And now onto the Wade picture overload. I think the bored thing is upping my pictures. Plus Wade has been hamming it up all adorable like. Oh, what? Did I say he was being a cute goober? He sort of likes me lazy cause I make a better play gym sitting down. He's also getting real interested in my belly - and by interested I mean that he mostly grabs and hits it, but occasionally he gives it a nice slobbering kiss. Helping Dada with the drill. Such a great helper. 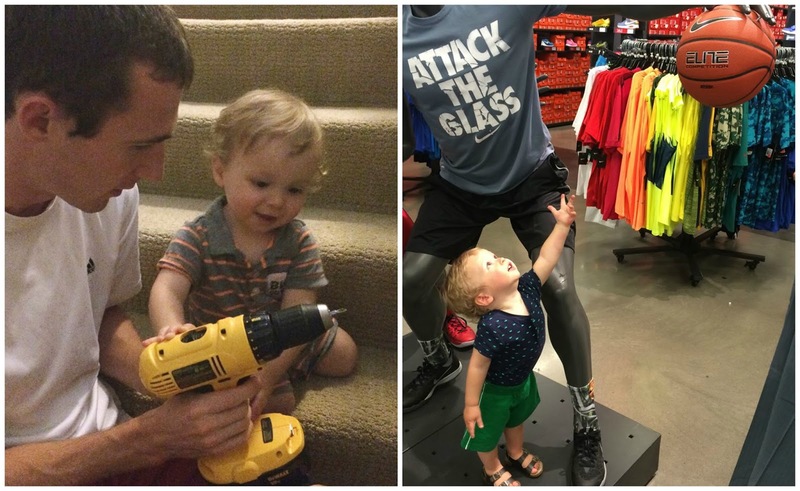 Helping Dada shop for new work shirts. He REALLY wanted this basketball. I pulled out the few gardening buckets I had and he's been a real dirt mover. Unfortunately I don't think I'm safe to actually plant anything this year. Along with dirt moving, water NEEDS to be involved. 90% of the time it ends up on him and he gets annoyed that his water vessel is empty when he goes to pour it. And his love affair with the washing machine continues. 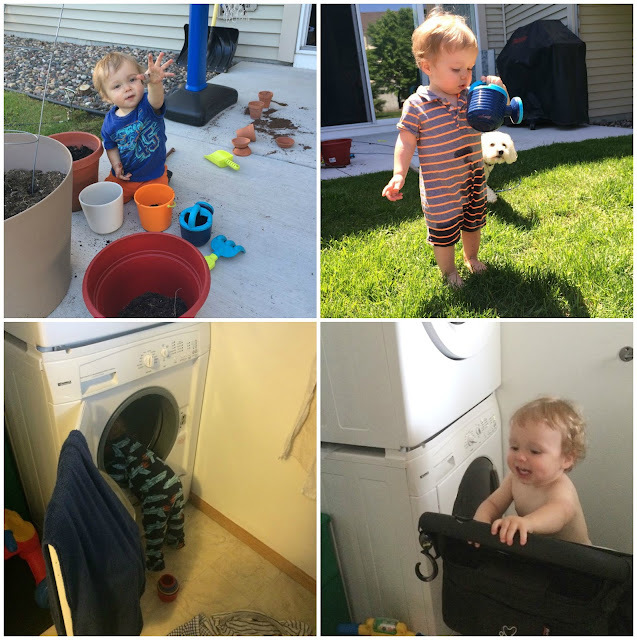 His stacking cups get put in individually, only to be pulled out again, stacked, then nested, then brought (proudly) to mom, then back to the washer. While doing a load I put the stroller in front to block him, which he immediately climbed up - appreciating the boost. Wade - 1 , Mom - 0. And, lastly, Wade is trying to eat like a big kid. Dipping things (here's it's strawberries in whip cream, later it was eggs in whip cream), trying to climb into his high chair himself (not thrilled about that! ), licking the goodness off his plate, and using utensils! Stella is thrilled with all these new developments, since mistakes end up in her territory. Husband moved into his office this week! Moving on up from the cubical life. It's pretty bland right now, he's given me permission to spruce it up! Husband got two Yahtzee's two games in a row. That's four in one night. I had my lowest scoring game ever. Hmmm...I should really work on logging more Husband updates during the week. Poor man. But, let's be honest - our kids are the most interesting creatures, we're kind of boring. I'm only exciting right now cause I've got kids inside. Hope everyone had a great week! More frivolous news next week!